By the Gods, it’s another take on the world of the ancient deities. Someone up in Valhalla will be wanting some royalties pretty soon. 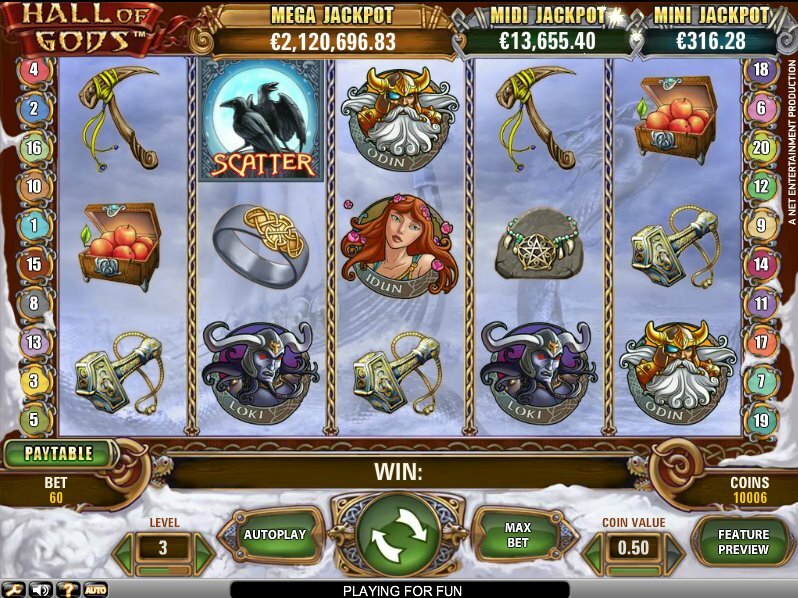 A 5-reel, 20-payline slot, the Hall of Gods features slot developer NetEnt's customary gorgeous graphics and a host of classic Norse characters. King of the gods, Odin, king of the baddies - Loki - and hammer-wielding tough guy, Thor, are here, as are a bevy of Valhalla-bound beauties taking centre stage on the reels. There are also hammers, amulets, rings and axes. Very much Microgaming's Thunderstruck 2 or Playtech's Thor slot, then. The mythical Midgard Serpent acts as the game's Wild, substituting all other symbols except the scatter and Bonus symbol. When appearing on Reels 2, 3 or 4 it expands in animated glory to cover the entire reel. Odin's ravens - which sounds like a nasty foot complaint - acts as the scatter. They award free spins depending on how many you hit on the reels. Five raven symbols will get you 20 free spins, so they're definitely worth hitting. Your wins during the free spins will also get a 3x multiplier. If free spins sound good, wait till you get the Bonus symbols. Three of those activates the Bonus Round in which you play the part of Thor. Use your mighty hammer to smash through a series of shields. Keep bashing away until you match three prizes - be it cash or jackpot symbols - and bank your win. The jackpots are progressive so this is really the game's biggest draw. Ancient themes are always popular in slots, and it'd be no surprise if Hall of Gods is a draw for years to come. The game has the classic mythology angle, the animation and graphics are clear and attractive, and the game has plenty of nice bonuses to entice you in. Free spins are good enough; progressive jackpots and expanding Wilds are just the icing on the cake. 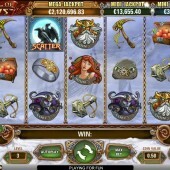 Myths fans are spoilt for choice when hunting out related slots. NetEnt's Greek myth-themed Pandora's Box is a good starting point, but the animated slickness of underwater-themed Triton's Treasure is definitely one to pencil in too.